I actually really enjoyed the Green Inferno. I'll be picking this one up! So this is just another 2K scan correct? Will it be much of an upgrade from the OOP original Hammer release? I think I'll probably stick with that. This was the first horror movie I ever watched so I'd certainly upgrade if worthy! The poster is just ok to me. I love the original French poster though! The poster is just ok to me. I love the original French poster though! Yeah. While I think it's one of the better Shout Factory posters the ad campaign for Frankenstein Created Woman had such awesome posters I can't help but think, "If I'm going to get a Frankenstein Created Women poster I can get better." Course with the way Shout's prices have been holding over the past year I guess you can't beat the added value of the poster. And as I was thinking with the upcoming Opera it adds to the resale value at the very least: from something you perhaps can't give away to something that'll double your money instead. So there's that. Really enjoyed revisiting Mans Best Friend too bad about the special features though on this bluray! There's a sale on Shout Select titles going on until Tuesday, 3/19. Some really good prices actually. X-human, russweiss and Katatonia like this. What Lakeshore title has Shout released before? fceurich39, Steel76 and satans-sadists like this. satans-sadists and Erick H. like this. I mever expected this to get a release at all, nevermind a STACKED one. 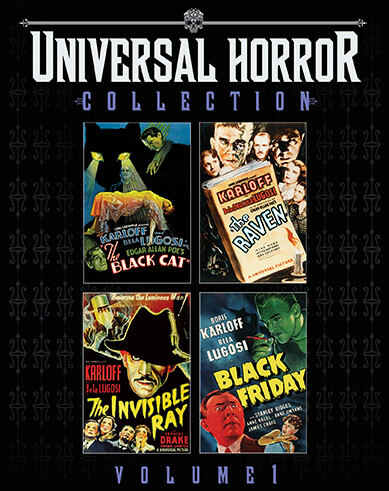 Shout have changed The Boris Karloff/Bela Lugosi Collection to Universal Horror Collection: Volume 1 and given it new pre-release artwork. The release date has also been pushed back to June 18th. Erick H., satans-sadists and buck135 like this.